The Soviet Union is often presented as a largely isolated and idiosyncratic state. Soviet Internationalism after Stalin challenges this view by telling the story of Soviet and Latin American intellectuals, students, political figures and artists, and their encounters with the 'other' from the 1950s through the 1980s. 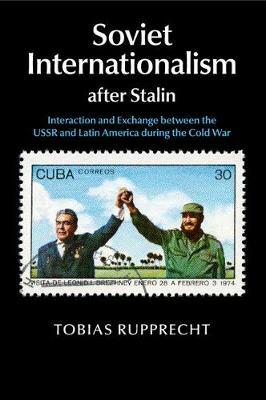 In this first multi-archival study of Soviet relations with Latin America, Tobias Rupprecht reveals that, for people in the Second and Third Worlds, the Cold War meant not only confrontation with an ideological enemy but also increased interconnectedness with distant world regions. He shows that the Soviet Union looked quite different from a southern rather than a Western point of view and also charts the impact of the new internationalism on the Soviet Union itself in terms of popular perceptions of the USSR's place in the world and its political, scientific, intellectual and cultural reintegration into the global community.